Viewhill, near Culloden Battlefield, where demolition work is underway. A controversial 16-home development on the edge of a buffer zone protecting Culloden Battlefield from development is likely to be limited to single storey housing, the Press and Journal understands. 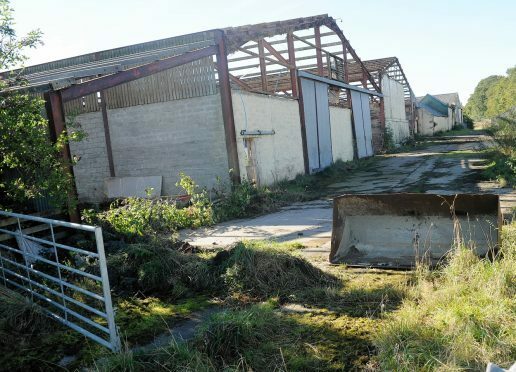 The demolition of a farm steading at the Viewhill site has begun, but it is believed a formal planning application is unlikely to be submitted this year. Landowner David Sutherland’s initial proposals had infuriated campaigners locally and across the world. It said the council had given a formal notice of initiation allowing it remove the derelict building. A spokesman for project managers Compass Building and Construction Services Ltd added: “The notice of initiation has been tabled now that we’ve met all the conditions attached by the Scottish Government’s reporter in January 2014, when he gave planning permission. “We have, for instance, complied with and resolved the various environment issues attached to the consent. He said considerable thought had been given to ensure the recommendations made by the reporter had been fulfilled. At the council’s orders, part of the steading was demolished two years ago amid safety concerns. An invisible shield was established in December 2015 to greater protect the heritage and sanctity of Culloden Battlefield. City councillors unanimously approved the new boundary, encompassing an area almost five times that of a previous development exclusion zone. It was the conservation’s area’s first formal review in almost 50 years. The 2,423-acre exclusion zone protecting the site of the last pitched battle fought on British soil insists on “responsible” development.